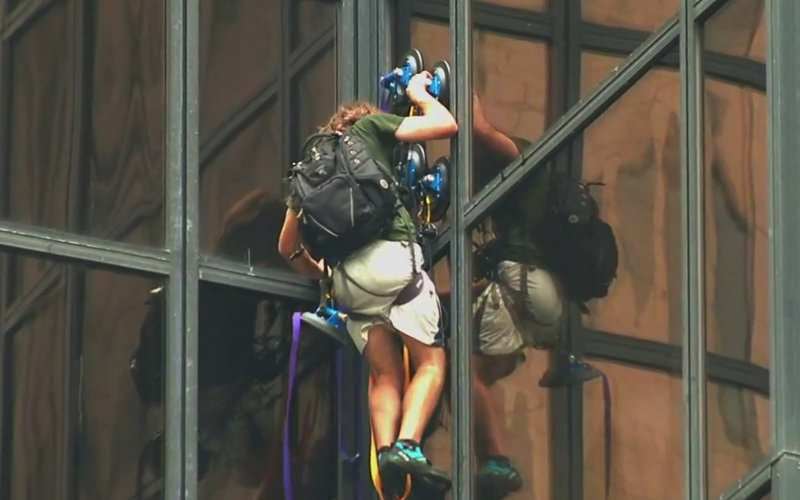 Yesterday, New York police arrested a man who tried to climb up Trump Tower in Manhattan using just rope and suction cups. He managed to reach the 21st floor before officers managed to grab the man and pull him inside the building. The 20-year-old man, from Virginia, wanted to meet Trump in person and the police believe the man didn’t intend to harm him. Within a couple of hours of his stunt he was already top trending on Twitter and the biggest news story to break, but while many of us assumed he was against Donald Trump’s campaign, he turned out to be a supporter. According to CNN‘s police sources, they believe the climber made this rather creepy looking video posted on YouTube the day before the ascent, titled “Message to Mr. Trump (why I climbed your tower)”. He described himself as an ‘independent researcher’ and wanted to deliver an ‘important message’ to The Donald. To end the minute-long video, he urged people to ‘go out and vote for Mr. Trump in the 2016 election’. After he was detained by the authorities the man was taken to Bellevue Hospital to be psychologically evaluated, authorities said. This man performed a ridiculous and dangerous stunt. I’m 100% certain the NYPD had better things to do. If Mr. Trump were here he’d be thanking law enforcement for the job they’re doing. He probably owes the guy credit for distracting the media for a few hours after his comments about ‘Second Amendment people’ finding a way to stop Hillary Clinton.